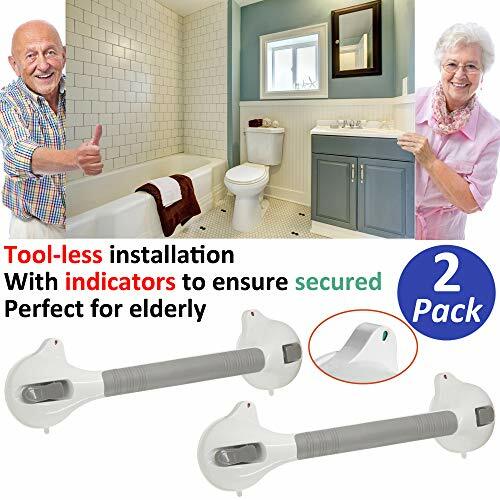 AmeriLuck 16.5inch Bath and Shower Suction Grab Bar, No Mounting Hardware Needed, Limited Lifetime Warranty. Easy to install or remove from the tub or shower walls with locking latches to secure bar in place. ✔ SAFE TO USE - The indicators on the side of the suction cup will change from red to green when a safe and secure hold is achieved. Before each use, test the firm hold of the suction device. Ensure that both indicators are GREEN. If the adhesion seems insufficient, release the suction assist bar and reattach again. ✔ PERFECTLY FOR ELDERLY - This could be a sweet gift for elderly parents/grand parents. ✔ WARRANTY - Limited lifetime warranty. If you have any questions about this product by AmeriLuck, contact us by completing and submitting the form below. If you are looking for a specif part number, please include it with your message.